can get to some of that information from our links page. opportunists and you have to try to keep ahead of them. breeding stock has health clearances and proper temperament, working abilities, and breed type. and working ability, and health issues. the shot game. 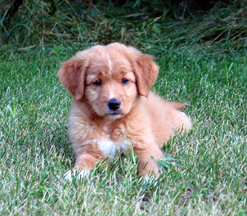 The Toller is a medium-sized, powerful, compact, balanced, well-muscled dog. and 45-51 lbs. The female is slightly smaller, 18-19 inches and 37-43 pounds. intelligent, and will work well when trained with a gentle hand. 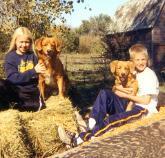 problems present in popular retriever breeds. possess the qualities important in the breed. they can be trained to be quiet if started at a young age. was founded in 1984, and titles can be earned in conformation, obedience, agility and field. 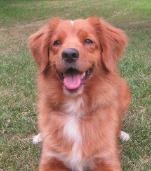 size, the Toller is not for everyone, and is happiest in an active home.